Site Lights & Cable Reels. Wax, Varnish, Polish & Oils. Weedkiller, Lawn Feed & Seed. Tool Boxes / Bags / Organisers. Drill Bits & Chisels - SDS+. Drill & Flat Bits & Holesaws. Sanding - Sheets & Belts. Discs - Cutting & Grinding. Drill Bits & Chisels - SDS Max. See all items in the store. 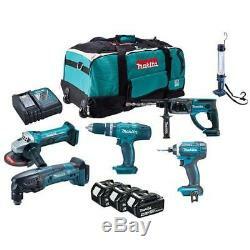 MAKITA DLX6021M 18 VOLT LITHIUM ION 6 PIECE CORDLESS POWER TOOL KIT. Usually dispatched within 24 hours. This Makita exclusive six-piece kit features the following products: 1 x DHP453Z Combi Drill 1 x DTD152Z Impact Driver 1 x DHR202Z SDS+ Hammer Drill 1 x DGA452Z Angle Grinder 1 x DTM50Z Multi-Tool 1 x DML184 Fluorescent Light 3 x 4.0Ah Li-Ion Batteries 1 x DC18RC Li-Ion Fast Charger 1 x Wheeled Duffel Bag The Makita DHP453 LXT Combi Drill is a cost-competitive kit with a single sleeve keyless drill chuck for easy bit installation/removal. The two speed gear box features metal gears for increased durability and long service life. Offers easy control, even in difficult applications thanks to its conveniently located push button for forward and reverse. Torque Settings: 16 + Drill. Max: Masonry: 13mm, Steel: 13mm, Wood: 36mm. The Makita DTD152 LXT Impact Driver has a compact design with an overall length of only 137mm. Although small it is packed with all metal gears and mechanical 2-speed control. The variable speed control trigger with forward/reverse rotation provides control, even in tough applications. It also has a soft grip handle that has been designed to maximise thrust right to the bit. With an electric brake for increased user safety and bright twin LED job lights for working in dark conditions. The Makita DHR202 SDS+ Rotary Hammer Drill is capable of drilling through steel, wood and masonry with ease. With the power of Lithium-Ion you can be sure to get the job done, wherever you are. Has a conveniently located push button for forward and reverse. High comfort grips, for maximum user comfort. Fitted with an LED job light with afterglow and a one-touch sliding chuck for easy bit changes. It has three operation modes (rotation only / rotation with hammer / hammer only). On rotation mode the chisel can rotate a full 360° with 40 different locking positions. Specification: No Load Speed: 0-1,100/min Impact Rate: 0-4,000/bpm Impact Energy: 2.0 Joules Drilling Capacity: Concrete 20mm, Steel 13mm, Wood 26mm Weight: 3.2kg The Makita DGA452 LXT Angle Grinder has been developed as the first Angle grinder of the MAKSTAR series models. It has an easy grip body that has high comfort grips. Fitted with an anti-restart function with a warning lamp and it is capable of using wheels or discs that are design for use with mains grinders. The electronic current limiter is also fitted with a warning lamp and a 4 pole motor. Specification: No Load Speed: 10,000/min. The Makita DTM50 Multi-Tool has a conveniently located thumb On/Off switch for ease of use when holding the machine. It has an easy to use variable speed control dial and a hex wrench holder on body. Accessories can be installed at 30º increments, across 360º and it comes with a dust extraction attachment. The Makita DML184 14.4/18V LXT Li-ion Torch gives off a bright ambient lighting over a wide area. The torch is lightweight and has a very long run time. It is fitted with a hanging hook. Can be used with 14.4 or 18 Volt batteries. DEWALT DCK266P2T 18 VOLT CORDLESS BRUSHLESS DRILL / IMPACT DRIVER IN TSTAK CASE. DEWALT DCK278P2 18 VOLT CORDLESS DRILL AND GRINDER TWINPACK DCD996 DCG412. DEWALT DCK276P2 18 VOLT BRUSHLESS CORDLESS DRILL/IMPACT DRIVER TWINPACK IN DS150. DEWALT DCK2532P2 XR Brushless SDS Drill + Impact Driver 18 Volt 2 x 5.0Ah Li-Ion. Sign up to hear about latest news & offers. Mon - fri 8:30am - 17:30pm, sat - closed, sun - closed. The item "MAKITA DLX6021M 18 VOLT LITHIUM ION 6 PIECE CORDLESS POWER TOOL KIT" is in sale since Friday, May 25, 2018. This item is in the category "Business, Office & Industrial\Power Tools\Combo Kits/Packs".